For two weeks every year, High Point, North Carolina, becomes “the Furniture Capital of the World” as 100,000 exhibitors and visitors crowd exhibition halls to present and to see the latest in furniture design and production. 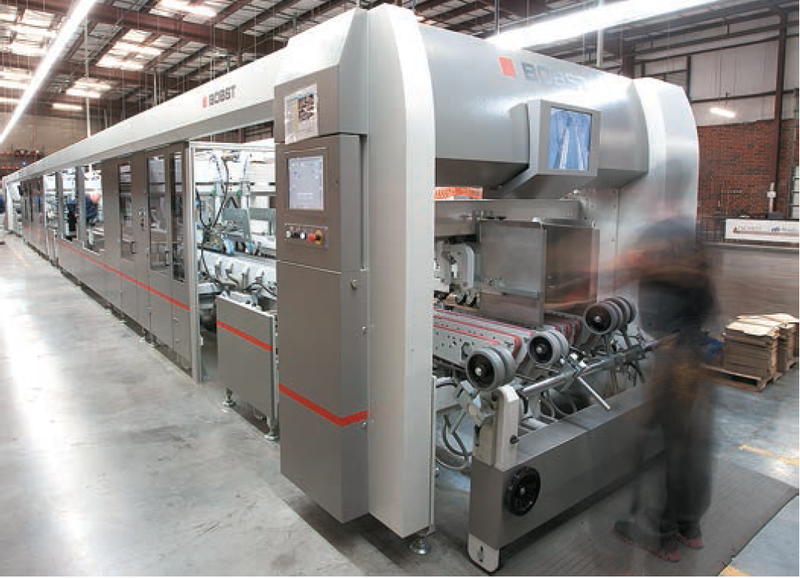 Late last month, High Point was again at the center of action as about 400 corrugated manufacturers and users descended on the city to view the latest in converting technology, as Packrite held an open house to display its new Bobst MASTERFOLD folder gluer with its patented Gyrobox board rotator. A highlight of the day was the appearance of North Carolina’s Lt. Governor Dan Forest, who saluted company owners, Michael and Mary Drummond, on bringing manufacturing jobs that require a highly-skilled labor force to the Tar Heel State. Lt. Governor Forest toured the facility with his hosts. Established by the Drummonds in 2008, Packrite has two major niches – as a manufacturer of miniflute packaging and as a finisher for the trade. 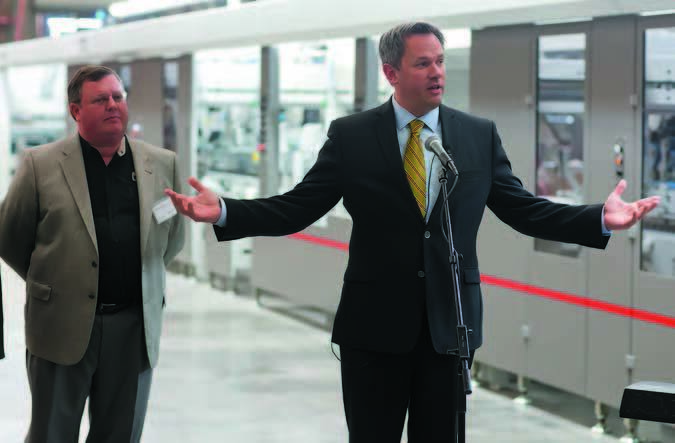 During the all-day open house in High Point, visitors toured the renovated 125,000-square-foot facility, which includes warehousing and roll stock storage, and saw product litho laminated on Packrite’s custom-built 64-inch Asitrade laminator, sent to a Bobst EXPERTCUT 145 die cutter for diecutting and then to a 67-inch Bobst MASTERFOLD for folding and gluing. The Gyrobox innovation allows Bobst to rotate a blank 90 degrees so that many complicated jobs that require multi-directional gluing and would ordinarily require two passes can be accomplished in just one pass, resulting in a doubling of production for some jobs. Packrite’s Gyrobox module, installed last December, is the first in the Western Hemisphere and only the second in the world. Drummond got hooked on Bobst equipment when he worked for his previous company, Preferred Packaging, a carton manufacturer. “Years back, Preferred bought a Bobst Alpina folder gluer,” he remembers. “It was the only piece of new equipment we had, and I was amazed at what we could do with this machine, said Drummond. So when the Drummonds started up Packrite, they began to equip the plant almost exclusively with new Bobst equipment. First came the Asitrade, which produces B-, E-, F- and N-flute sheets from 23-inches by 23- inches to 64-inches by 65-inches at speeds up to 10,000 sheets per hour. Parallel to the Asitrade is the Bobst EXPERTCUT 145 diecutter with Bobst’s Power Register system, which can cut cartonboard up to .060 pt. and corrugated up to B-flute at speeds up to 7,500 sph. Between the Asitrade and EXPERT on one side of the factory and the folder gluers on the other side lies the only older piece of equipment in the plant – a Woodward jogger-aerator. “We like the older Woodward because it’s heavier than newer models,” Drummond explains. The plant utilizes two Bobst folder gluers. The older one, a MASTERFOLD 130 glues boxes in sizes up to a 51 7/8-inch by 35-inch at up to 100,000 pieces an hour. Parallel to that, both closer to the laminator and die cutter is the machine that saw its debut last month, the Bobst MASTERFOLD 170 G + S. This machine includes the Accufeed blank aligning device, the Polyvalent pre-breaking module, the patented Gyrobox rotator section, an Aligning module that follows the rotation and the Combi one and two sections before the final folding section. While the Gyrobox is new to the corrugated market, it was first developed for the folding carton industry in 1998, reports Yvan Magni, Bobst’s Product Support Manager, Specialty Folder-Gluers. The innovation was debuted at a German boxplant in 2011, he notes. “The demand for this product by corrugated manufacturers began in recent years, and Bobst’s research and development team then developed the MASTERFOLD with the Gyrobox in response to this need,” he says. “This machine puts Packrite in a position to do something no one else in North America can do,” Magni adds. Steve Creasy, VP of Bobst’s Sheet Fed unit, agrees and sees the development of equipment such as the MASTERFOLD and the Gyrobox as key to Bobst’s unique mission. “We’re trying to provide innovations such as the MASTERFOLD and the Polyjoiner for shelf-ready packaging, to name just two, that will enable our customers to differentiate themselves in the marketplace and add value to their products. “Our first North American installation was well placed,” he added. “Michael has a flair for design.” Drummond saw the machine at a Bobst Open House in 2011 and confirmed his order at Drupa. Another new machine at Packrite is a Packsize EM 7- 25 On-Demand Packaging machine installed in early March. The machine, made by Salt Lake City, Utah based Packsize, cuts, creases and scores Packsize’s corrugated Z-fold into boxes that meet the exact specifications of the shipper. “This product is perfect for shipping both product and samples to customers,” Michael Drummond says. One of the customers that visited Packrite at its open house was Todd Burke, VP of Sales and Marketing for ThatBox, LLC, a unit of Fort Mill, South Carolina based The Packaging Warehouse, a contract packager and designer of corrugated products. 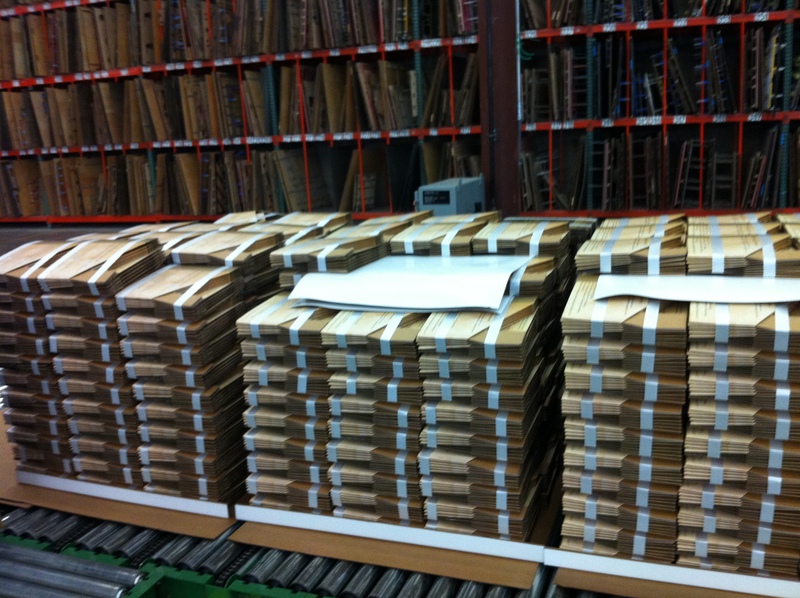 ThatBox has no printing capabilities in house, so it relies on Packrite for its printing and diecutting. 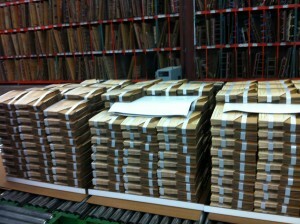 Then the sheets are sent back to ThatBox for finishing on its custom-made gluer. “We needed a vendor for printing and diecutting and started to use Packrite about three years ago,” explains Burke. “We’re both design companies, and their expertise and service have helped our company grow.” At the open house, Burke broached the possibility that Packrite might supply the printing, diecutting and even the finishing for one of its newer products – a custom-designed corrugated cooler. “We try to partner with all our boxmaking customers,” explains Kristie Smith, Packrite’s Director of Customer Service. “ThatBox has been a great partner.” If ThatBox’s cooler, targeted for Christian organizations, is a big success, ThatBox might even send its custom- made gluer up to High Point and let Packrite handle its gluing operations as well, Smith said.